It seems to boost the health of people with heart failure. It might also help with erectile dysfunction. As a supplement, it seems to help with several conditions, from migraines to inflammation. Many men with cardiovascular disease also suffer from erectile dysfunction, which only contributes to their stress and diminished quality of life. In fact, 75 percent of men with heart disease have erectile problems. It is understandable, when you think about it in terms of one major underlying factor impaired circulation. If the blood vessels to your heart are damaged, your heart doesn't get adequate blood. Pycnogenol resulted in significant improvement in sexual function in men with ED, according to this 2003 study. L-arginine and yohimbine were found to increase sexual arousal in a 2002 study of postmenopausal women with sexual arousal disorder. In terms of dosage, a pilot study published in the journal European Urology found 6 grams of L-arginine combined with 6 mg of yohimbine was successful in treating men with ED. For a comprehensive list of studies about L-arginine and erectile dysfunction, you can go to this GreenMedInfo page.Nitric oxide is also believed to play a role in women's sexual function. Estrogen contributes to the control of genital blood flow during female sexual response (Musicki et al, 2009). Declining estrogen appears to play a role in regulating vaginal NO signaling in vaginal tissues, although the mechanisms are still poorly understood. L-arginine has been shown to be essential to sexual maturation in female rats. The building blocks of protein that is present in our bodies. There are 20 amino acids but we can produce10 of these as the other 10 (essential amino acids) can only be acquired by consuming the correct foods. Should the body lack in these essential compounds, the proteins will be fragmented in search of the nutrients it needs. We can store fat and starch in the body but not amino acids so it is necessary for us to have a good balanced diet to receive all the required essential nutrients daily. As much as 75 percent of the body is formed with chains of amino acids which shows just how important they are to your system functions. 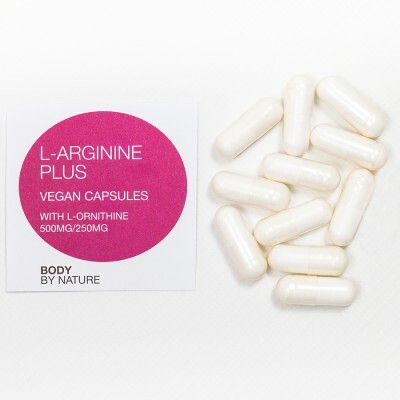 L-arginine Plus with L-ornithine, microcrystalline cellulose; capsule (vegetable cellulose). If you pregnant or breast-feeding, consult your doctor before taking this supplement. Yeast; wheat; starch, gluten; soy; lactose; added sugars, colourings, flavourings & preservatives.